Decompiler are special modules that work on units as input instead of artifacts. They produce units as well, representing portions of decompiled source code. The following picture shows a child decompiler unit, as well as a suite of decompiled classes units. 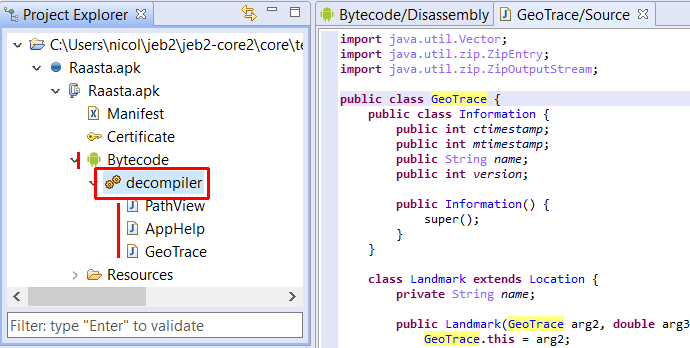 In the assembly view, position your caret on the area of code you would like to decompile. Conversely, you can go back to the assembly from a decompiled view by using the Tab or Q key. By default, a view representing a portion of decompiled code (eg, a class) will be replaced by the next class being decompiled. This default behavior is to avoid cluttering the workspace with tens of views representing various decompiled artifacts. 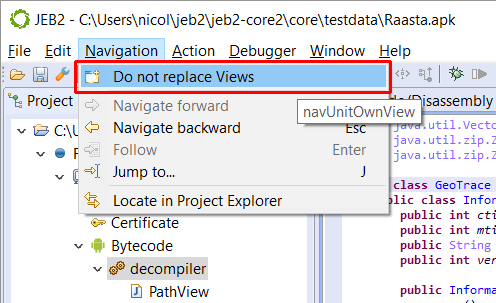 However, if you would like to open every piece of decompiled code in a separate view, you may do so by checking the Navigation, do not replace Views menu option. Generally, when it comes to interactity, decompilation plugins proxy requests to their corresponding parent code unit. That means that the actions set offered is essentially the same. The consistency between views is maintained.